Not everyone is fortunate enough to have their own garage. A significant number of people are known to park on public streets. But how does that leave your windshield during snowy seasons? That is why you need a quality snow cover to protect your car from rain, strong winds, and anything that might drop onto the windshield from above when your vehicle is parked. For a cheap product, this practical armor for your vehicle is reliable. 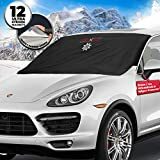 Because of the mass-produced competition, you need to set apart a high-quality but straightforward windshield cover for the winter that will save you all this hassle of scraping. For this reason, we have a detailed review to assist you when making a purchase. Security and Flexibility: the ideal snow cover should fit multiple types of vehicles, from sedans, SUVs, or small trucks. A good strap system allows the cover to fit even large windshields despite its size. Consider security measures like security panels so that the cover will not be blown away by wind or stolen. Stealing of windshield covers is fairly common, unfortunately. Size: Most of the brands we’ve mentioned come in universal sizes. However, it is essential that you double check your measurements before parting with your money. Fitting covers will not allow any water or ice in and are also less likely to be blown away. The cover thickness determines how resistant it is to ice falls. A thicker cover is, however, harder to store. Flexible material allows it to lie in close contact with your vehicle’s windshield, wipers, and hood. This prevents snow and ice from sneaking in underneath the cover. Measuring 82(L) x48.8 (W) inches, this cover is appropriate for a range of vehicles. This includes Minivan Trucks, SUVs, and Cars. 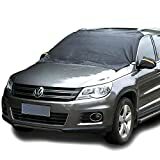 The windshield cover spreads easily on the car and will fully cover the windshield. It’s made of tough non-abrasive materials that will stop the rain, snow, ice, dust, bugs and other things. And thanks to the smooth non-scratchy interior, the glass or trims will stay free of scratches, chipping and other negative effects. The unit remains firm on the windscreen courtesy of the elastic edge and magnets. Placing it on the car, just like removal, is easy and straightforward. With this cover, your car’s windshield should be well protected from the snow, ice, rain, strong wind, debris, and other things. It’s available in an easy-to-place design and this makes using it convenient. The cover measures 87 inches long, 50 inches wide and should work with many cars. It’s made of cotton, PEVA, and comes in a 3-layer design for extra strength and protection. Additionally, its double sided meaning you can use either of the two sides. The UV protection stops harsh sun rays from ruining the windshield and other parts of the car. It works with SUVs, Trucks, and Cars. This unit offers more protection than most in its price range. The windshield cover is effective in preventing any pernicious, view-blocking snow from accumulating on your windshield. Adjustable straps easily secure the cover to the car to prevent it from getting stolen and keep it from coming loose. You can’t notice help but notice the side-mirror pockets, so they are secured too. There’s no space between the car and the cover for even the smallest piece of snow to get in. The company ensured a universal size, so it works well with most wheels. A decent bargain considering what it costs. Universal fit for close to all vehicles. Easily folds into a small package for convenient storage. This highly useful product will speed things up on snowy or icy mornings. 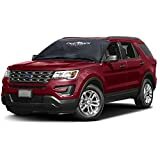 This extra-large option offers desirable has excellent protection from scratches, sun, snow, and rain. Six magnets are placed at the edges of the cover to help to keep it in place even through the toughest wind storms. An easy tie system ensures it doesn’t get blown away by the wind. Unlike other windshield covers, there is hardly any breaking in time with the thick, heavy-duty, durable fabric so that it will perform for you from day one. The company allows for refunds in the rare chance that their product doesn’t impress you. If you find yourself clearing your windscreen of snow and ice on a daily basis, try this out, and you will thank us later. It is made from thick heavy-duty polyester, a material which has gained favor from many manufacturers and users alike for its durability and waterproofing capabilities. Also very good, it comes equipped with elastic straps and extra-long side panels that can be secured to each door to prevent it from getting stolen and safeguard it from strong winds. This is the perfect car cover to have during those morning rushes when you are in no mood for scrapping sheets of ice from your windshield. There is a thermal shielding for trapping heat below cover so that the ice on top melts away. It boasts being a best-selling automotive windshield snow cover. On those chilly winter mornings, getting up and seeing all the snow covering the car is the most annoying thing for many people. Fortunately, we have Ice King to thank for this excellent car accessory. Fitted with ultra-powerful N52 magnets on the edges, it secures well onto the windshield and protects it from frost and snow. You will be impressed by how well the cover has been sewn together. It seldom comes with pesky strings and ties, so you can simply fit it on and take it off equally quickly. It is one cover that provides the all necessary protection from the elements; all you got to do is remember to install one before the snowfall starts. It is extra-large (50 by 70 inches) meaning it is perfect for all vehicle sizes. The company offers a 30-day money-back guarantee. Forget the hassle of constantly removing snow, ice, bird droppings, dust, and other things from your car’s windscreen. You also shouldn’t regularly deal with scratches or stains because of leaving the windshield exposed. With this cover by BriteNway, the windshield will stay protected from the ice, snow, rain, wind, dust, dirt, and many other things. It’s easy to place and remove courtesy of the lightweight and good design. And thanks to the universal design, it works with different cars such as minivans, SUVs, trucks, hatchbacks, and sedans. The smooth interior won’t scratch the glass or the trims whereas the adjustable straps help you select the best fit. Say goodbye to scrapping the snow, ice and other things from your windshield. With this cover from Cosyzone, the windshield will fully be protected. All you need is simply placing it on the windshield. It features 3 magnets that help to secure it in place and is made of a tough fabric to endure the snow, ice, rain, wind and much more. The piece also provides UV protection it stops the harmful relays form the sun. It has a nice practical dimension and to fit on Sedans, Hatchbacks, SUVs, Crossovers, Tricks, Minivan and other cars. Even the most massive snowfalls are no match for this windshield snow cover. The makers chose to use six magnets on the edges of the cover to keep out any snow or water. They also decided to make its size universal, so it is compatible with all automobiles. Extremely easy to install and release, it also comes established with security flaps that fasten the cover to the car to prevent theft. You really can’t beat this level of protection and quality considering the price. So this is a genuine product all around. And again, you get a free storage bag with this purchase. Anyone with a car understands how bugging it can be scraping ice and snow off your car’s windshield when you have to go for a drive during the cold season. Thankfully, this windshield cover is designed well for the work. The good thing is it can be utilized on all trucks, SUVs or large-sized vehicles to safeguard it from snow and frost. It only takes zero effort to place this cover on a vehicle, and when there’s heavy wind blowing outside, the straps attached to the wheels will still secure the cover. Folding up the cover is a matter of seconds and can be placed in the storage bag provided. We highly recommend this car cover for those who live in really cold states. The package also offers covers for side mirrors. You also have suction cups and side wings to secure the car cover without complications. 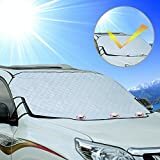 No more scraping frost, ice or snow in frozen mornings! This windshield cover offers more protection than usual for sedans and pickups, minivans and trucks. The magnetic edges ensure it stays in place during vigorous winds while its double-stitched door flaps keep the cover from getting stolen. You don’t want to waste time in the morning struggling to unfasten the cover locking mechanism when you should be on your to work. It is also amazingly inexpensive. In other words, this is the best car cover to use in the winter. This cover has simple exterior straps and door flaps that are very easy to use. It is the most affordable in our least at less than $ 10. After viewing the information on this page, you should be able to decide which one is best for you. All the products we mention remarkable in their ease of use and benefits. But the Apex Automotive Premium Windshield Snow Cover beats all in matters ending unnecessary hassles of scraping off ice and snow from your windshield every morning. This car cover is uncomplicated to use. It’s also very flexible and easy on your budget. 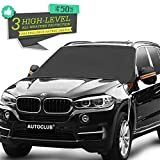 If you are on a quest to find the best windshield cover that offers a high degree of protection while being very easy to install, then this is it. The setup is essentially a cakewalk, and it fits virtually every type of vehicle, so the uses are unlimited. The makers used six powerful magnets at the edges to ensure that it holds tightly on to your car and prevents entry of snow and water. And it is not scratchy so it won’t damage the car in any way. All these fantastic qualities justify why this pick has to be a Best Seller among the hood covers on Amazon. Why scrape all winter long? Get yourself this piece today while stocks last. The security flaps secure well to your vehicle and keeping the cover safe from the impact of strong winds. 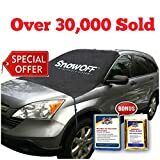 This is a windshield cover efficiently takes the strain out of removing snow. Six powerful movable magnets are sure to keep the cover secured in place even during strong gusts of wind. The cover offers sizeable universal size, thus capable to easily fit most family cars, trucks or any other type of vehicle. In fact, this car is large enough to accommodate wipers too, not even a handful of car covers do that. It is also comfortable to use and very convenient to attach and detach. This cover will hold on the vehicle like a blanket without causing any scratching. It’s made from amazingly sturdy material too. You get a free drawstring storage pouch. There is 100% customer satisfaction guarantee. This is hands down one of the most fantastic car covers on the market. The best part is that FrostGuard lets you express more love for the NFL franchise you support whenever snowfall starts by offering covers with different team badges on them. Made from water-resistant materials, it also keeps the car protected when it’s rainy outside. The cover fabric is very flexible, and won’t scratch the surface of the vehicle. You will also like the universal fit, meaning it’s large enough to fit all small and standard-sized vehicles. The adjustable FitFast straps are tucked into the door of the vehicle, preventing it from getting stolen. This elegantly simple item allows you to clear inches of accumulation from your car, truck or SUV in a matter of seconds. You also get an NFL branded compact pouch for storing the cover when not in use. The NFL customization will blow away any football fan.